Moving on to the next challenge: Mayo and James Horan are ramping up their preparations for the arrival of Roscommon on Saturday week and the start of the National Football League. Photo: Sportsfile. Mayo exited the FBD League on Sunday last after going down to Galway on penalties in Tuam - while Mayo now have a weekend off from official competitions, they won't be resting on their laurels as they gear up for the arrival of Anthony Cunningham's men on Saturday week. Speaking after the game, Mayo manager James Horan said: "It’s disappointing to lose any game, particularly when we were in that position (up by three points deep in injury time ). We’re two weeks away from the national league now and we need a game next weekend. It would have been nice to have been playing Roscommon next weekend, but we’ll play them in two weeks anyway. We’ll get a game for next weekend and prepare for the national league." As for the positives to take from the contest, he added: "We got something from the game, I thought we managed a lot of it fairly well. Conor Diskin’s first senior start for Mayo, he showed well and got two points. Fionn McDonagh, James McCormack, a lot of the new guys came through it and got a bit more experience in a close game against Galway, so from that point of view it was good." 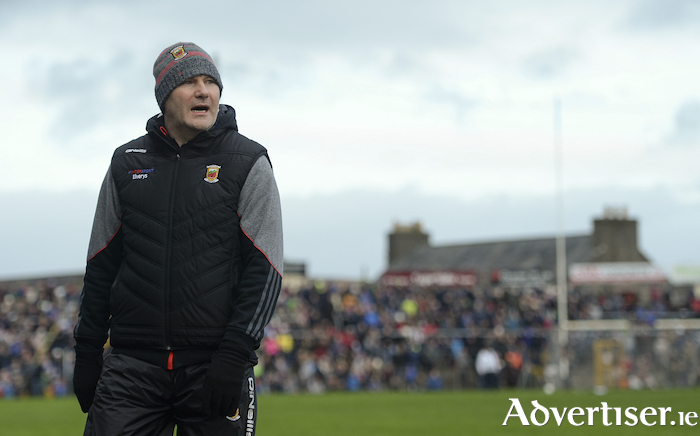 In the first half, Mayo looked the better side, but for the second week in a row faded out of the contest and there were plenty of things that they need to improve on from the performance, according to the Ballintubber club man. "The tempo of it was very low. We had six scores from 14 shots so that return isn’t good enough. We gave 35 balls away during the course of the game and they’re the boring things that we’ll be looking at. We gave an awful lot of unforced errors away and that just kills you in a game like that. But there’s plenty for us to take from it, particularly some of the new guys were very good." Conceding the goal to Galway is something that Horan was disappointed with - and not just the time of the game it came at. "If you take the timing of it, it was poor. It was a long ball in, we’ve made a few subs and I don’t know if the message was clear what we were trying to do. Maybe we got caught out, but yeah, if you’re three points up in injury time, you’d expect to be able to hold on to the game." With the new rules that have been trialled in the provincial competitions being discussed by GAA Central Council this weekend - and the potential of some being rolled on into the league and others scrapped - teams still don't know what they will be dealing with when the league throws in next weekend - and the Mayo manager is not a fan. Speaking about the incident where Mayo had a good goal-scoring chance pulled back for a mark by Jason Doherty, he said last Sunday: " Have a look at it. The rules are in, but we’re attacking there in the second half against a strong breeze, we’d extra numbers. The right play is to hand-pass the ball, but we had to kick it and we gave away a turnover because we didn’t kick it. The rules, for me, encourage poor behaviour and wrong decision-making, so for me they can’t be right. "I said it before, the referees are the guys that are struggling the most, I think it’s impossible to ref now. Even there, there’s guys shouting about three and four hand-passes from the stand, and the ref is looking around so he can’t watch the game, so it’s very difficult for him." While Mayo did score from winning attacking marks against Galway, Horan still doesn't see it being a good rule change, saying: "No, I don’t. Jason Doherty, if he wasn’t pulled back there, we had a two on one for goal, so I’d say you might get a couple of marks and scores from it but you’d reduce the number of goal chances, I think that’s what will happen, in my opinion. Even there, David Drake caught a defensive mark and if he’d attacked with it, he was gone. But you win it and you stop, everyone resets, so it’s slowing down the game from that point of view. We’ll see what comes out of it."